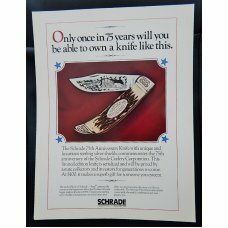 You are buying a Schrade + LTD U.S.A. 1937-1997 Sixty Years of Wetlands Conservation. 171Pro Hunter pattern Ducks Unlimitd Customized Knife. This knif..
You are buying a Schrade Walden Stainless N.Y. U.S.A. 897UH pattern knife with Staglon handles. Nickel silver bolsters, brass liners with #29745 on th..
For sale is a Schrade 75th Anniversary Knife, 11 x 8 3/8 icatalogue page. It is printed thick gloss paper. This page is for the $100.00 edition oif t..